I have always been a fan of the TomTom navigation devices. From buying my first TomTom One in the days where you had to hide your satnav when you left your car at night (or take it inside) to the days where we have it as apps or much cheaper devices. Heck, my TomTom was stolen from my car recently, and I was more amused than angry, and of course, a little bit sad. The TomTom One I have had was bought about 9 years ago, and it has served me well all this time. From navigating through Europe to the back streets of London, it has delivered. Funny, it was so old that back in those days, they used to have pins on them, just to make sure thieves don’t get away with it. I am sure it wouldn’t have been sold for more than a tenner on the black market, if they had managed to unlock it. Anyway, sob stories aside, since then, I have been using various apps to see what works. I have tried CoPilot, as well as AcerNav, which is actually made in partnership with TomTom. Then there are apps such as Google’s own map navigation. They have their pros and cons. CoPilot is a pretty neat package, of course, and works truly offline. AcerNav is good, but I found the GPS reception to often be lacking. Google’s reliance on the internet makes it far from ideal. While I am pretty satisfied with CoPilot, I wanted to try what TomTom had to offer. You see, things have recently changed with the TomTom app. You had to pay to get the app. There were other fees too. All that has changed. Now the TomTom app is free on Android, and while you still may have to pay, it lets you get a flavour of what is on offer through the app. The catch? You are only allowed to drive/navigate yourself through 50 miles a month for free. Any more, you have to pay £14.99 for a year’s unlimited drive, or £34.99 for three year’s worth of unlimited driving. A small price to pay if you find the app worth it. So, the question is, is it? To answer this, I installed the app, and gave it a whirl. First thing you have to do is to install your required maps. As expected, you get a fair few options of maps to install, and they all come with their disk space usage requirements. Unfortunately, it doesn’t give you any option to install on SD card, but somehow managed to do that automatically anyway. If you’re low on space, and don’t have an SD card, you are probably better off with a sat nav of your own, as most maps will take a fair amount of space. UK, for example, is about 700MB. Western Europe, about 4GB. No biggie for an SD card, but if you have an 8GB or 16GB phone, that is most of your free space gone. After maps are installed, you’re good to go. The app feels quite different to the actual satnav device. The menu has bigger buttons, and a scroll option. You look for areas, and you then get an option to drive. Somebody was complaining that it doesn’t let you drive to particular cities/towns/villages, so I looked up that option. The trick is to navigate to a town, click on POIs (points of interest), and then find one in that section to navigate to. – Offline Maps: Maps are stored on your smartphone. So you don’t need an internet connection, or data roaming, to plan a new route or re-route. – Navigate to Contacts: Never memorize an address again. Select a contact from your list and the app will plan your route. – Quick search: Find your destination faster with intuitive search results. Quick search starts to find your destination as soon as you start typing. Average speed camera zones: Actually measures your average speed in them, and lets you adjust accordingly. Very clever! Up to date maps mean most new roadworks, speed cameras, etc get reported and on your app straight away. Will still make you drive down a silly single carriage road, as all sat navs do. So, these are my first impressions, after driving around with this for a couple of weeks. Is it worth the extra spend? I won’t say no, but I haven’t paid for it myself yet, mainly because I am not sure if my next phone is an Android or not. If it is though, I will pay the £34.99 it costs for three years straight away. Alternatively, you can search for TomTom in the Google Play Store. TomTom have now offered a way for everyone to try out their very well designed app. Making it free for 50 miles a month is a clever one, as if you get used to it, you will run out quickly. The cost though, in only about a pound a month, so it is easy to justify. 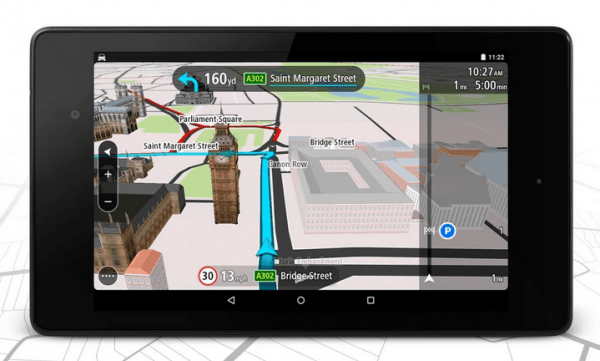 Is this the best satnav app I have tried on Android? Yes, yes it is!